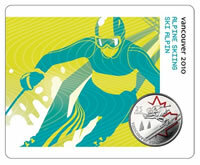 Two days ago, on October 24, the Royal Canadian Mint (RCM) released 25-cent alpine skiing coins to the public. These coins commemorate the Vancouver 2010 Olympic and Paralympic Winter Games. Today, the RCM has confirmed reports that some coins made for collectors have a 2008 date on the obverse (heads) side instead of the correct 2007 date. The error coins were limited to the Alpine Skiing Coin Sport Cards sold only through "Petro-Canada outlets and a small quantity of Vancouver 2010 Olympic Winter Games coin collections." The coins are specially painted versions and sell for $7.95. The Royal Canadian Mint has said they’re investigating the cause and will lock down measures to ensure it doesn’t happen again. Although Mints dislike producing errors, they’ve proven to be extremely popular with coin collectors and, depending on the rarity of the error, they can sharply increase a coin’s value. It’s unlikely few in the public will be upset with the Mint, given the rarity of such errors. More interesting will be finding out how they actually happened.